We sell many slate hearths into and Around the Bristol and bath Area our Natural slate is ideal for sitting a log burner onto as it has a very smooth naturally riven surface. with sizes stating from a 900 x 600 x 20mm up to a larger size of 1500 x 1200 x 30mm, we can offer a single 1 piece T shape Fireplace slab as well as many different shaped ones. ​As well as bespoke cutting service we also have off the shelf hearth stones that we can finish with a range of 3 sides such as sawn, 5mm bevelled edge , or 1/2 bull none. 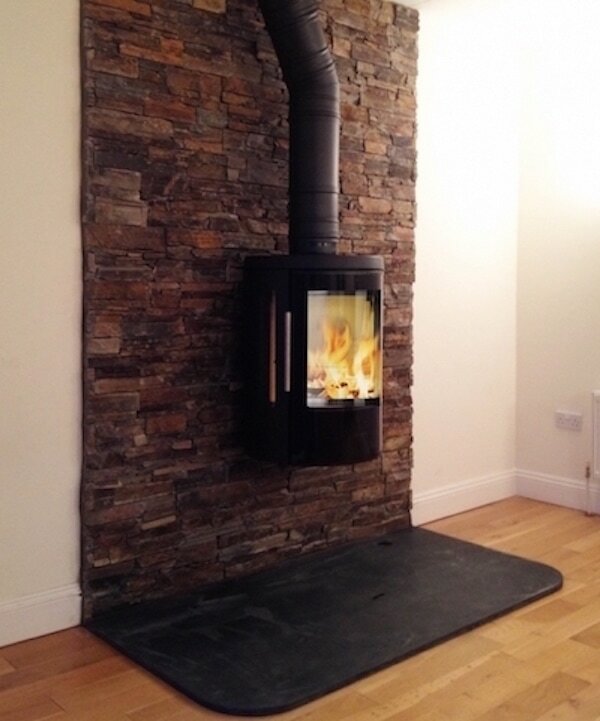 Deciding on a hearth stone for any wood burner can be a daunting thing but with slate you can rest assured that it will fit into the decor of any room in the house and be around for many generations to come due to its strong and natural makeup after all it has been around for millions of years already.